Matthew Mc Conaughey is virtually unrecognisable in director Stephen Gaghans Gold. Sporting a beer belly and a row of crooked teeth, Mc Conaughey puts his all into his role as true life prospector Kenny Wells. In 1988, Wells oversees the running of his family business called Washoe Mining Corporation. Based in Reno, Nevada the business is one small step away from folding when Wells has a dream about striking it rich in Indonesia. Stealing his wife’s watch, that he bought her as a gift, he raises enough money to fly to his promised land. Once there he manages to persuade geologist Michael Acosta (Edgar Ramirez) to take him into the jungle in the hope that they can find gold. Spending every last cent he has taking core samples Wells is just about to give up when one of the last samples shows traces of the precious metal. After the core is fully tested the results show that Acosta and Wells are sitting upon an untapped reserve worth millions. After he finds the gold Wells finds that he’s suddenly the most popular man on Wall Street as multi-national companies try and cut themselves a piece of Wells golden pie. However everyone is not to be trusted as deals are done that are worth hundreds of millions of dollars. 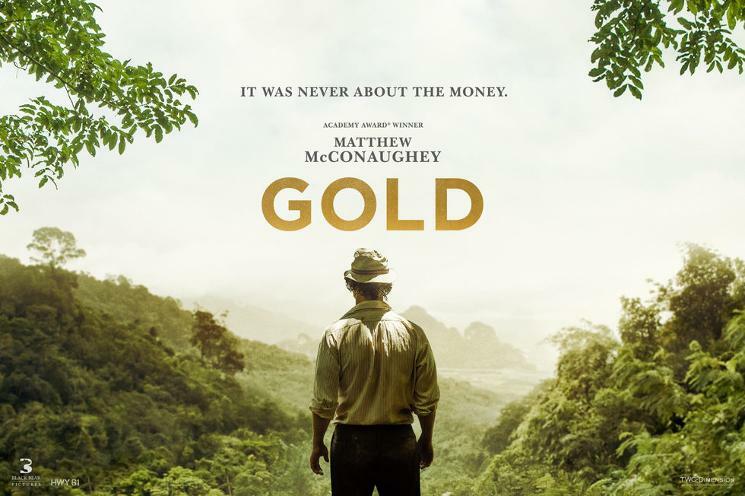 Gold is a hard watch at times, the story, especially in the first two thirds is confusing and difficult to pick up. This is in part is down to the actors tendency to mumble and in Mc Conaugheys part, down to his hard at times to understand, southern drawl. However this doesn’t take away from the fact that Gold is an enjoyable tale that will keep the audience guessing right until the very end.